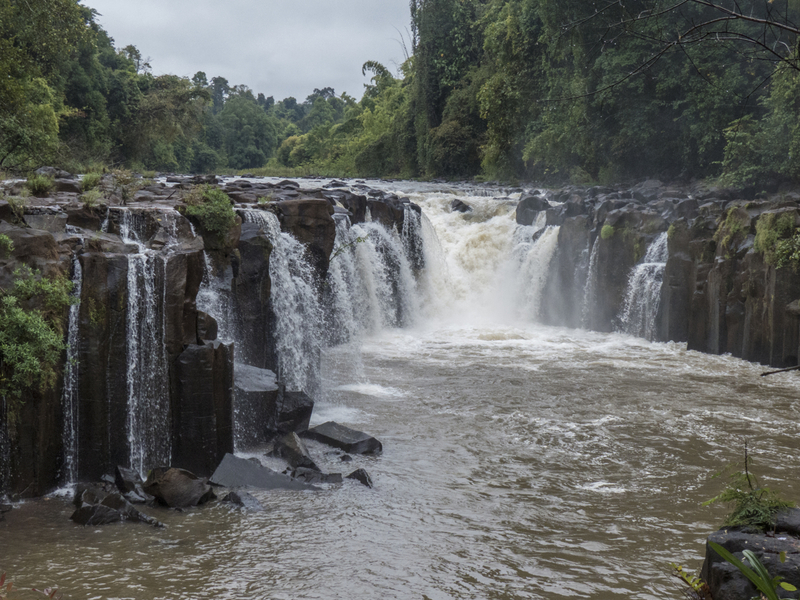 After a night near a waterfall in a rustic guesthouse we set out for the second day of our adventure. It had rained all night and the day looked to stay wet too. 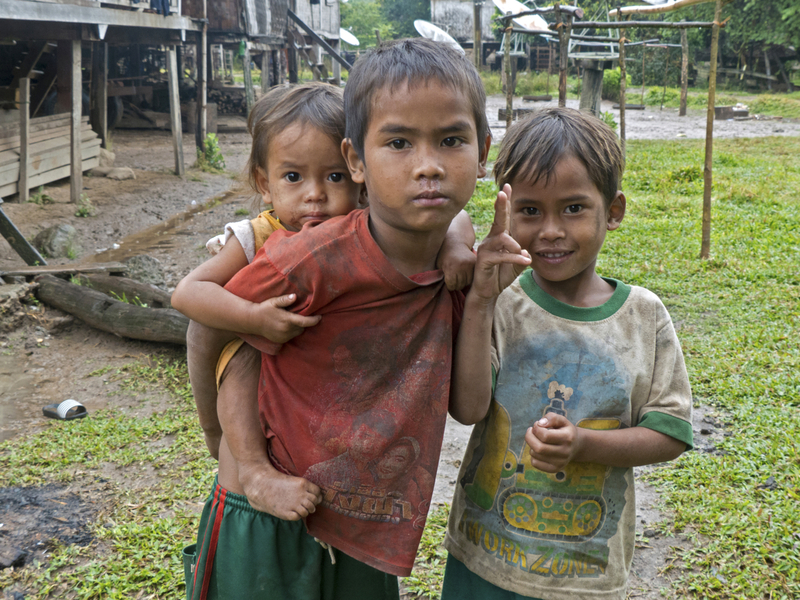 We were still elated after our visit to the Katu village of Ban Kandon the day before. We knew it had been a unique and special adventure. 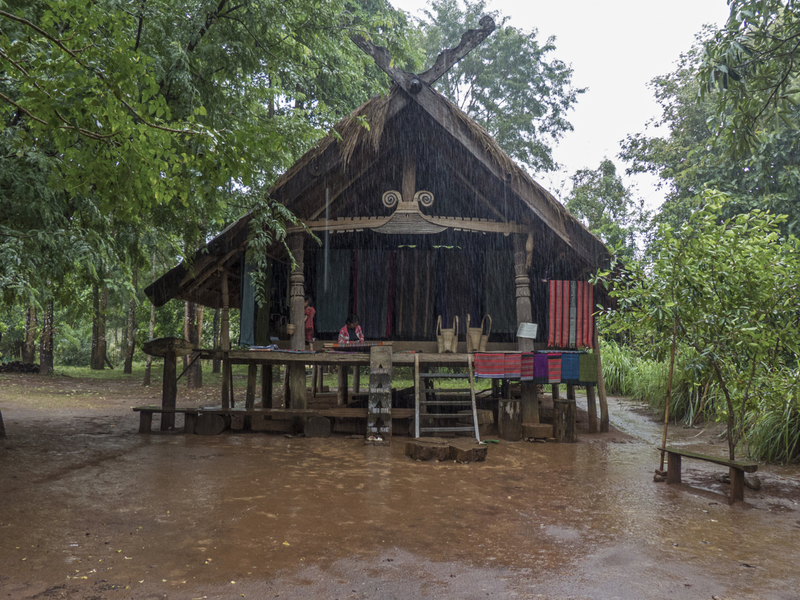 We also knew this day would be different as the Katu village scheduled for our second day is visted more often by tourists. 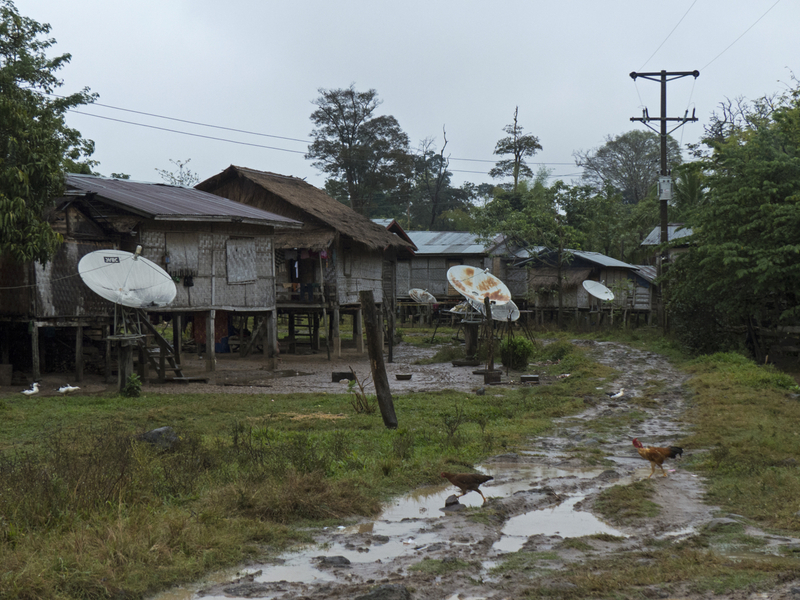 We arrived at the village and were immediately aware of the number of satellite TV dishes around the village homes. There had been no obvious TV in Ban Kandon. 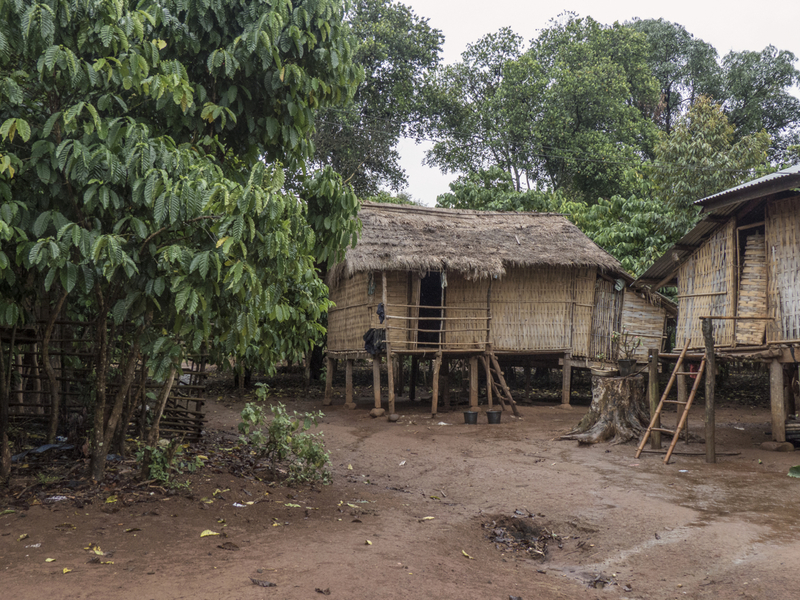 There were Laos style wooden homes as well as huts with bamboo siding and tin roofs. 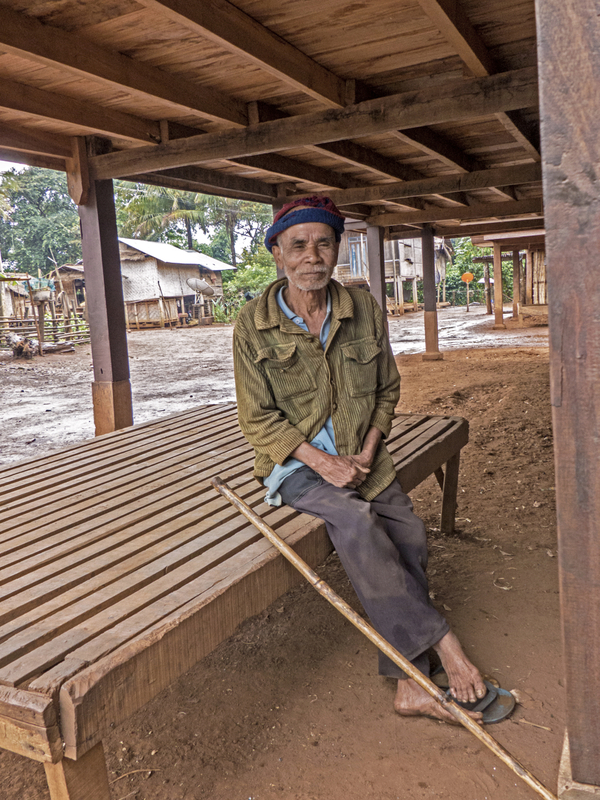 I learned that the government is providing many of the tin roofs. Certainly they last longer and do not have to be repaired as often as thatched roofs.. This was similar to what we had seen in Ban Kandon but the feeling of the village was different. It was not as well organized or as pristine. 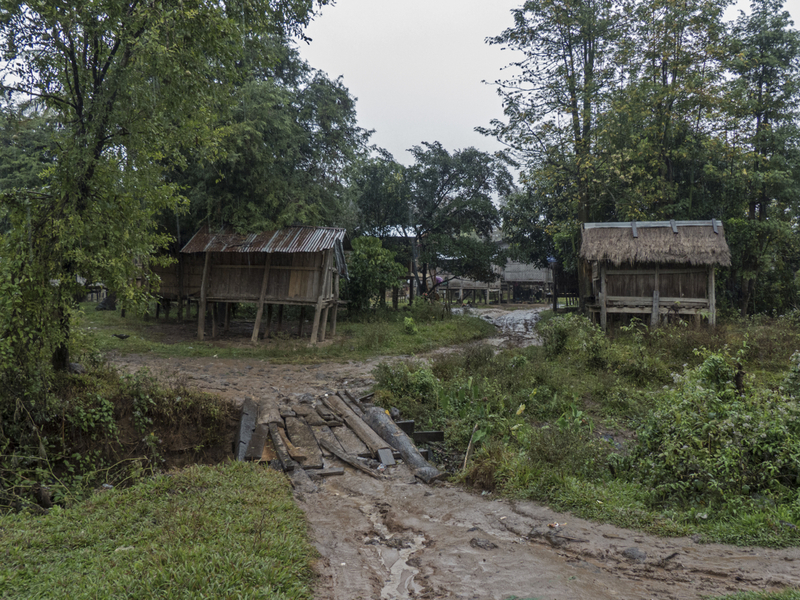 Some of the homes and huts did not seem to be cared for. Aod (our guide from Green Discovery) led us down the muddy lane into the village and he stopped to talk to villagers on the way. The first family he spoke to explained that they were Ta-oi. 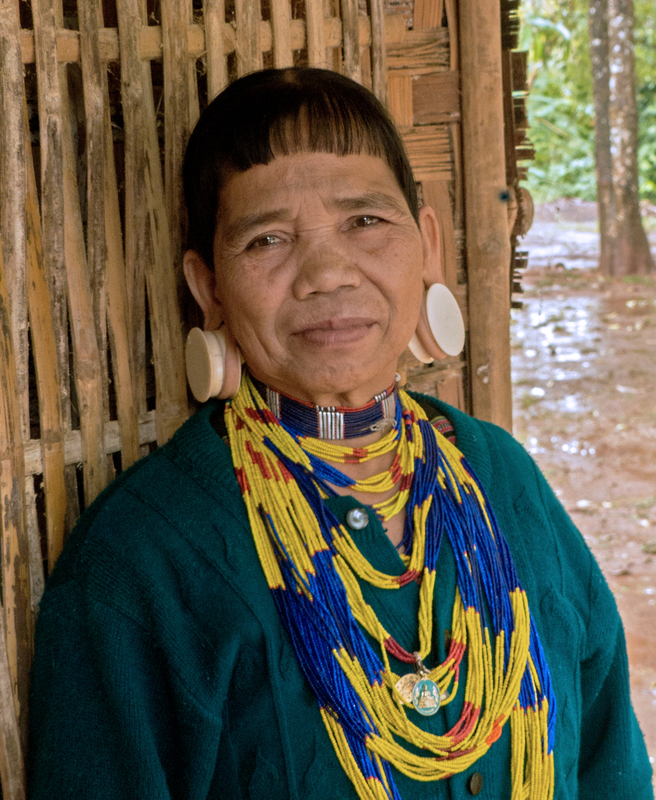 As we walked around the village and Aod continued to visit we learned that this village had been started in the early 80s and was made up of multiple ethnic minorities, not just Katu, who had walked down out of the forests looking for a better quality life for their families. There was no chief here. No Wipad to protect the people. 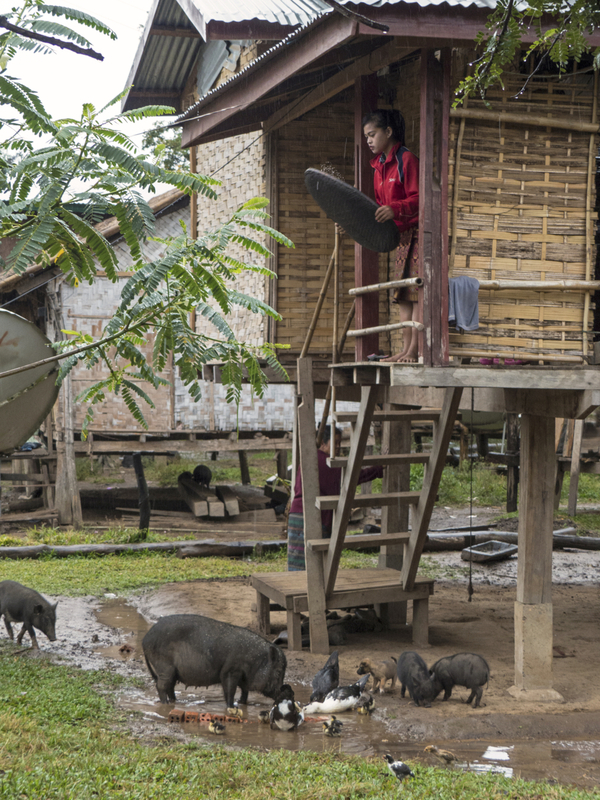 The exodus of these people from their forest homes was not organized or planned. 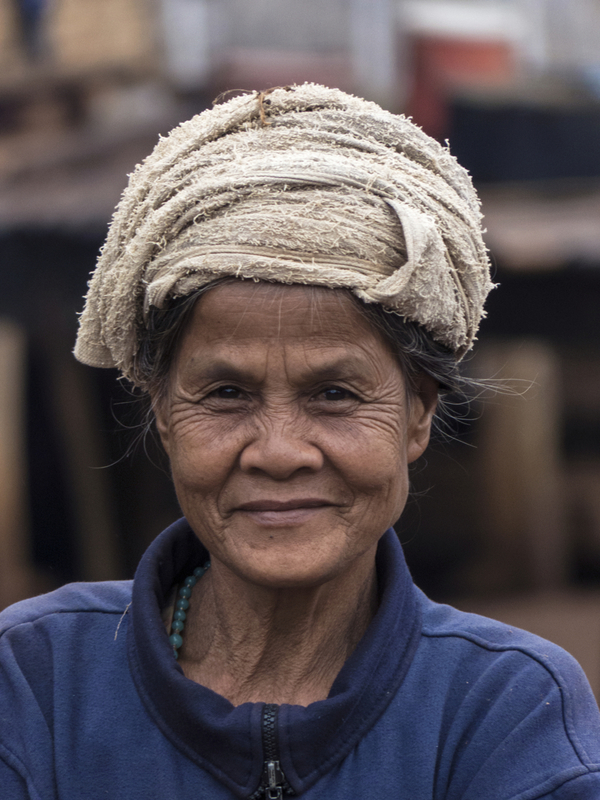 The majority of the villagers have given up growing rice and work in the fields tending coffee for the large coffee producer Dao. The coffee plants growing in the and around the village were green and covered with ripe coffee beans. 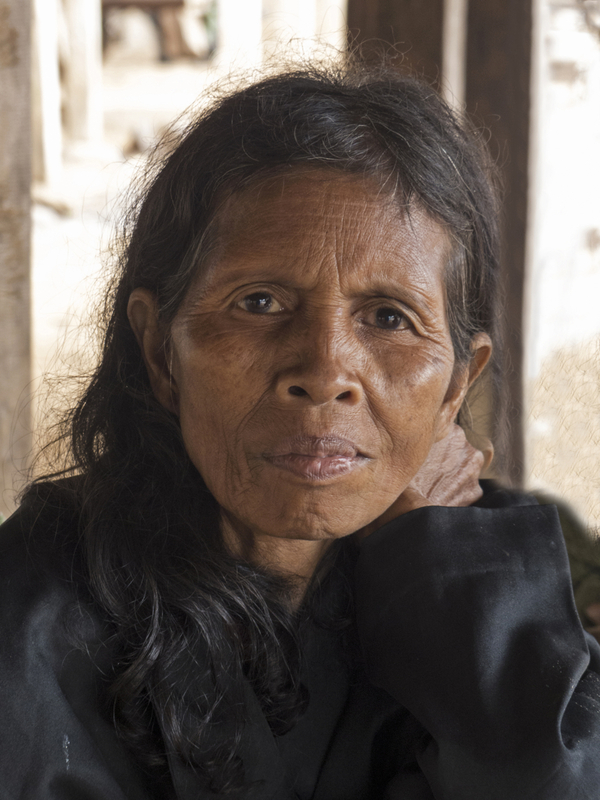 Aod also explained that the villagers have mainly put aside their animist beliefs and are Buddhist. 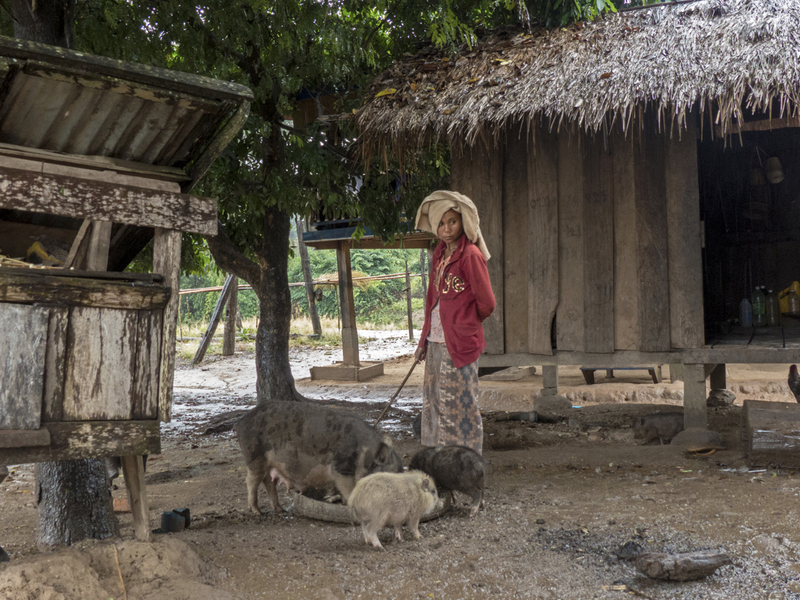 Buddhism is the predominant religion in Laos. 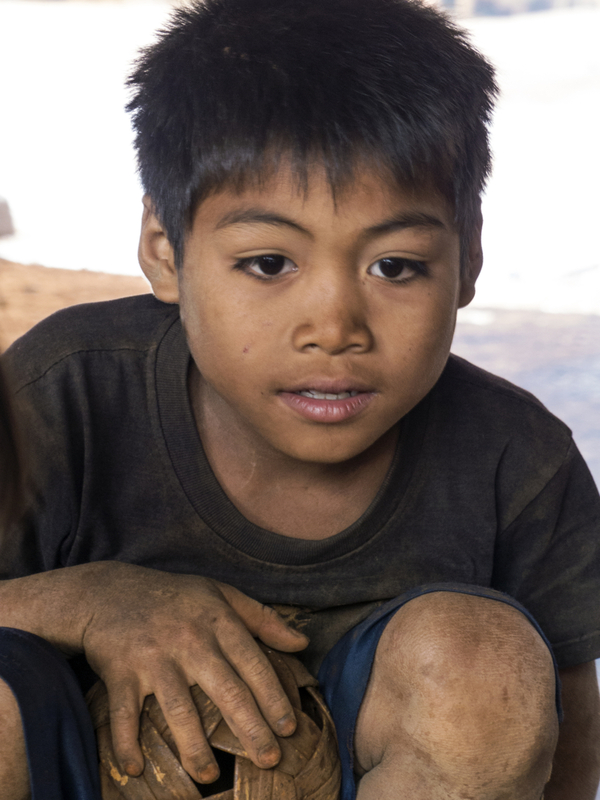 Most Laos boys spend at least 3 months in a temple, where they shave their heads and wear saffron colored robes, studying buddhism. Some of the boys stay longer for a continued education provided by the temples. One man that Aod spoke with explained that he was catholic. His was open about his reasoning for converting from animism as well; he said being Catholic is easier than believing in the old spirits. I don’t have to make offerings for the spirits. There are less rules to be obeyed. 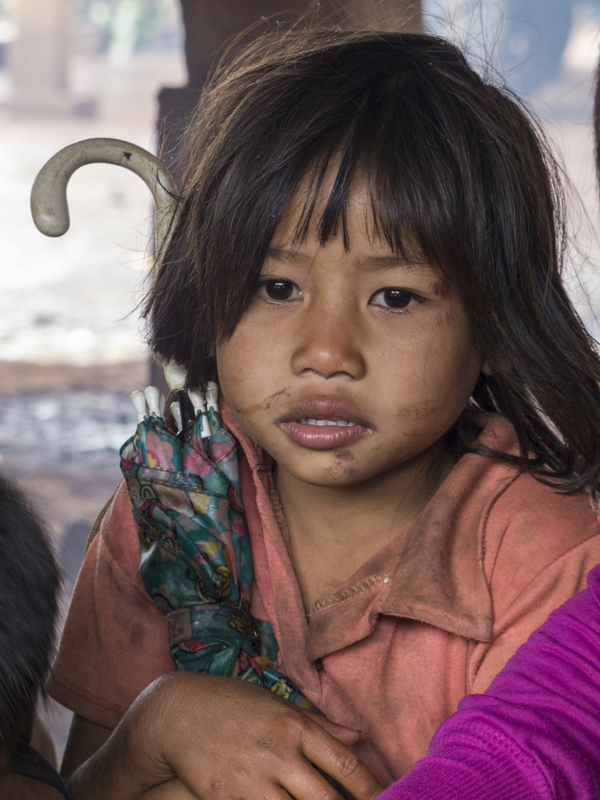 Unlike the children in Ban Kandon, almost all of the children in this village who came happily by saying “Sabaidee, Sabaidee” pointed to their hands and asked for Kip Laos. Always a good indicator for the number of tourists that have passed by before. However, in spite of all the tourists before us the people were very friendly. Almost all smiling and allowing Michel to photograph them. One woman giggled and hid her face in her hands after Michel showed his view finder and the picture he had taken of her. I have seen woman have the same reaction all over the world :). 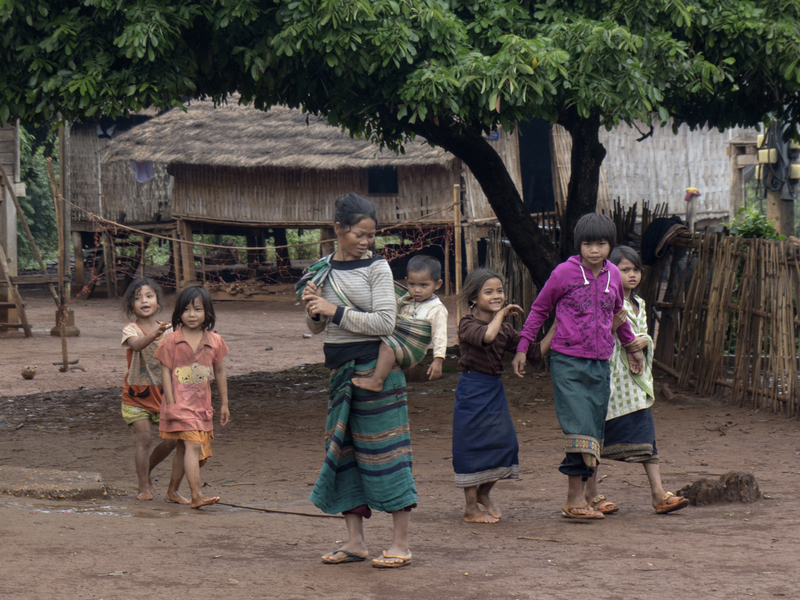 Aod continued to chat with the villagers as we moved closer to the center of the village. Eventually we found people who said they were Katu. As we walked to the center of the village we found the community house. 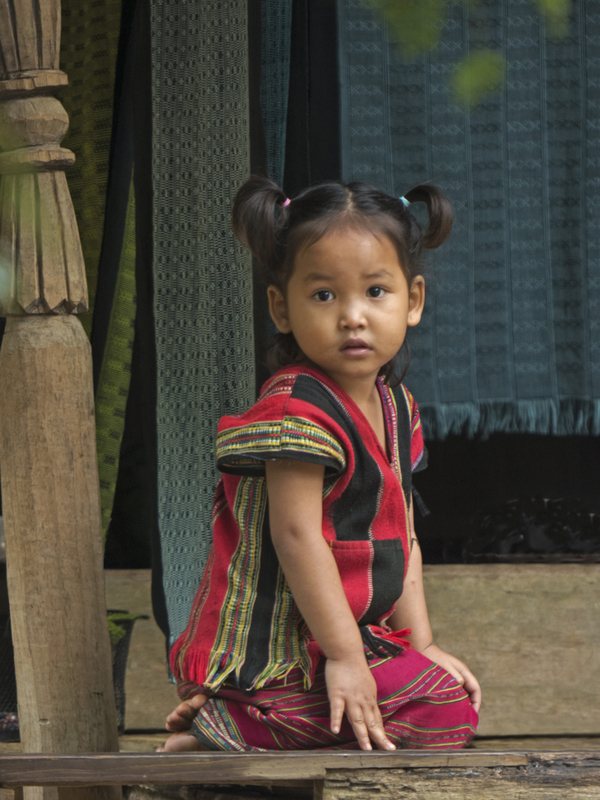 We felt so fortunate to have seen the community house at Ban Kandon first. 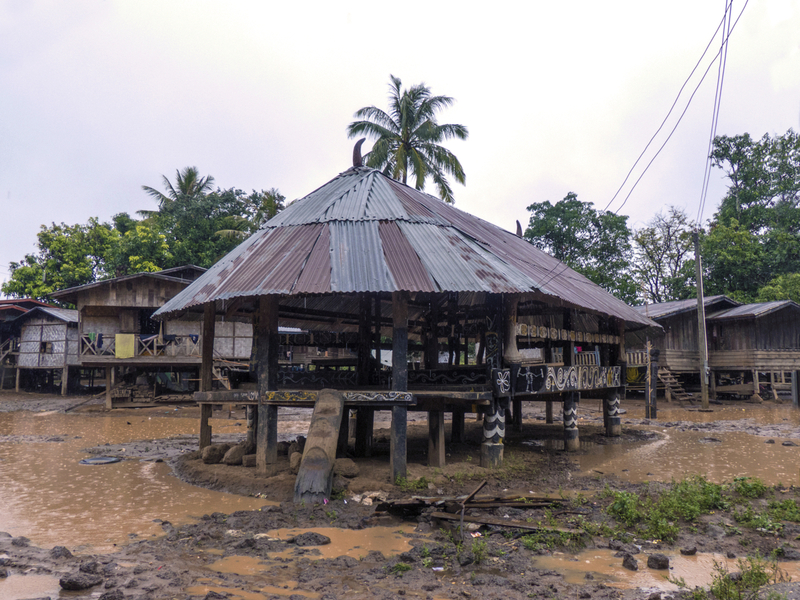 The difference created by the tin roof compared to the thatched roof in Ban Kandon was heart wrenching. But there were other more subtle differences. Many of the story telling posts and carvings were absent. Where was the monkey and his coconut or the snake eating the frog? Many of the carvings inside the community house were missing as well. 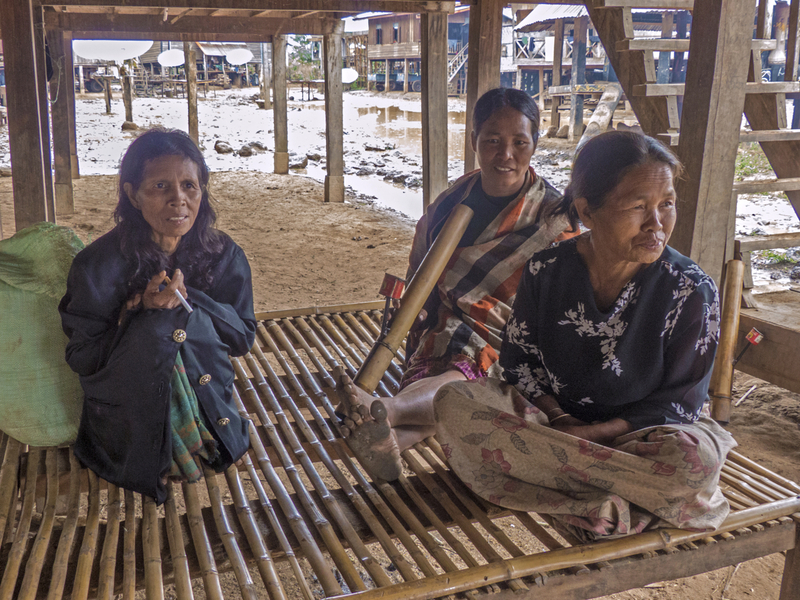 Nearby we found local women smoking traditional Katu pipes. Small signs that some Katu traditions had been preserved. 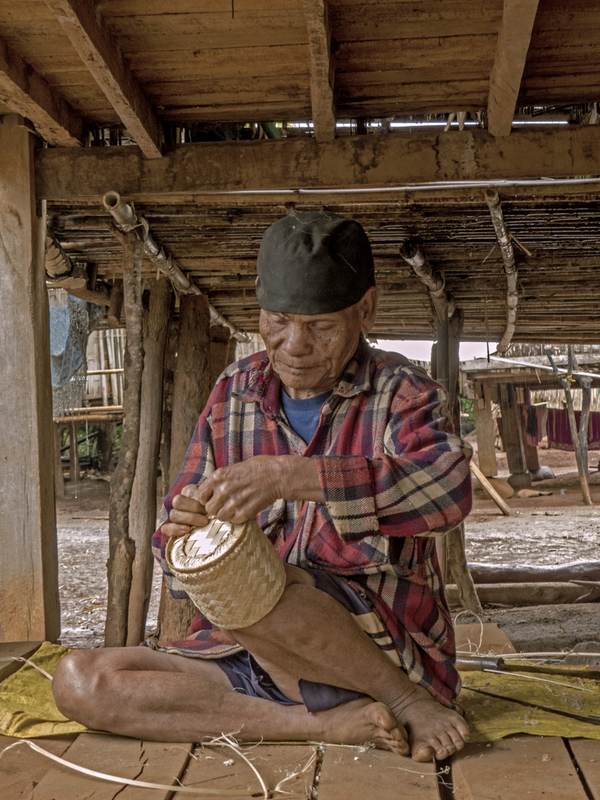 Aod explained most of the ethnic minorities living in this village have lost their traditions. There was no sign of the long bamboo pole identifying disharmony. Instead we found a large tarp covered area near the center of the village and underneath a stereo system with speakers blaring pop music loudly. We climbed back in the van and went on to our last stop for the day. The Tat Lao waterfalls are near a faux village that has been built specifically for tourists. Bus loads of tourists come here every day to see these representations of actual Ta-oi, Alak, and other ethnic minority villages. 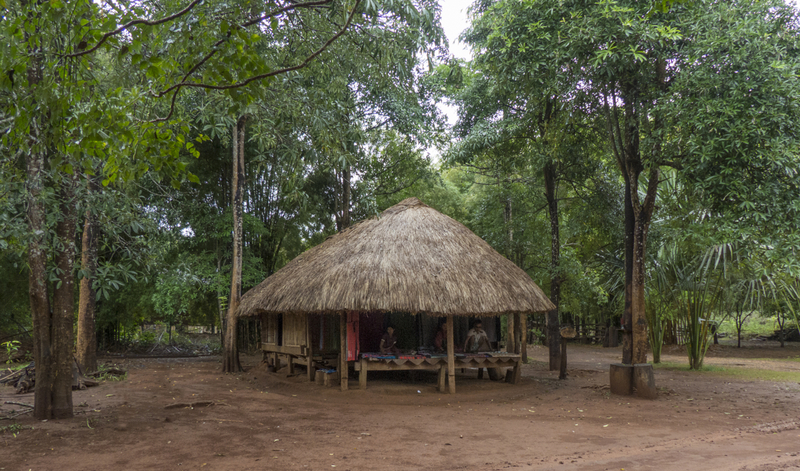 A single hut has been built in the style of each tribe. We walked down to the lovely waterfalls as Aod and I discussed the many times he brings tourist here each year. How few of them look any farther than this last fake village. We had all become good friends with Aod during our two days on the road. He is a very good man supporting his wife and 1 year old daughter. I highly recommend him to anyone who comes to Pakse or to his home town of Don Khone. He can be reached through Green Discovery in Pakse. We saw him later during our travels toward Cambodia. He and his family invited us to a home cooked meal in Don Khone. We truly enjoyed his family and their generosity. 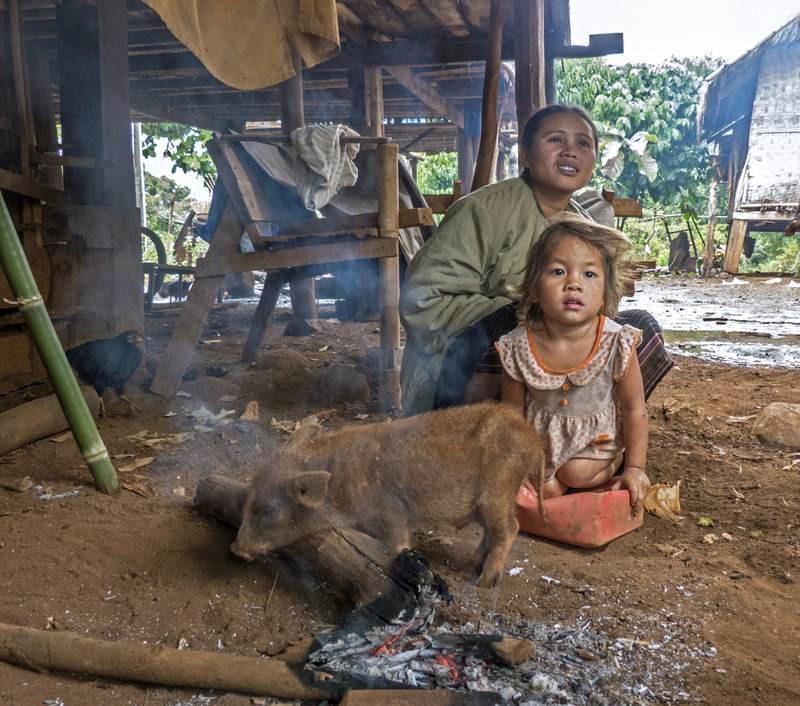 We began our two days with the Katu in a village struggling to preserve their customs and beliefs. With Wipad’s leadership they have managed to adapt to this new life on the plateau and still remain a strong community. Our second day was even more poignant as we witnessed a possible future for Ban Kandon filled with intermarriage and loss of customs. Even worse the potential for ancient beliefs to merely remain as a way to make money from the tourists passing by. 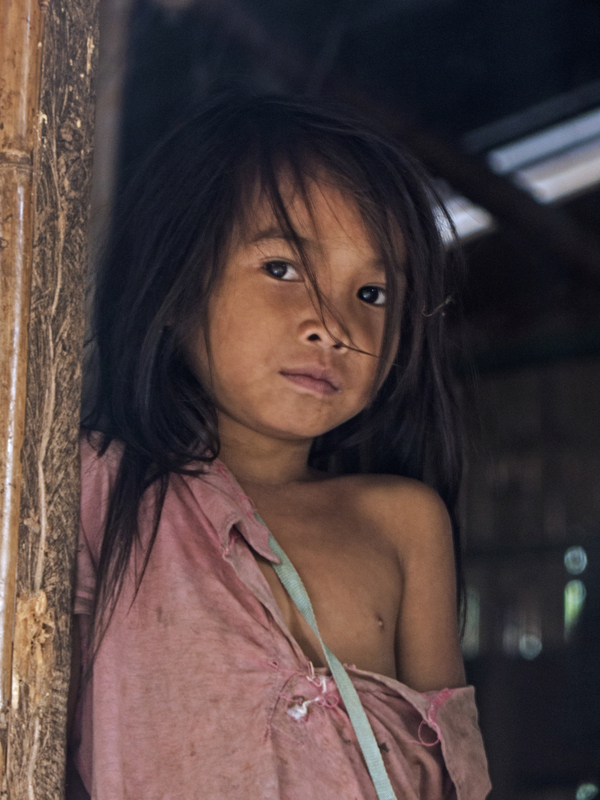 I suppose this is all part of a natural evolution that cannot be stopped in Laos but Michel and I cannot help but feel a sense of loss as we witness it.